Apparently Canada’s leading wireless carriers would like fewer of us to check Facebook on our smartphones every morning. 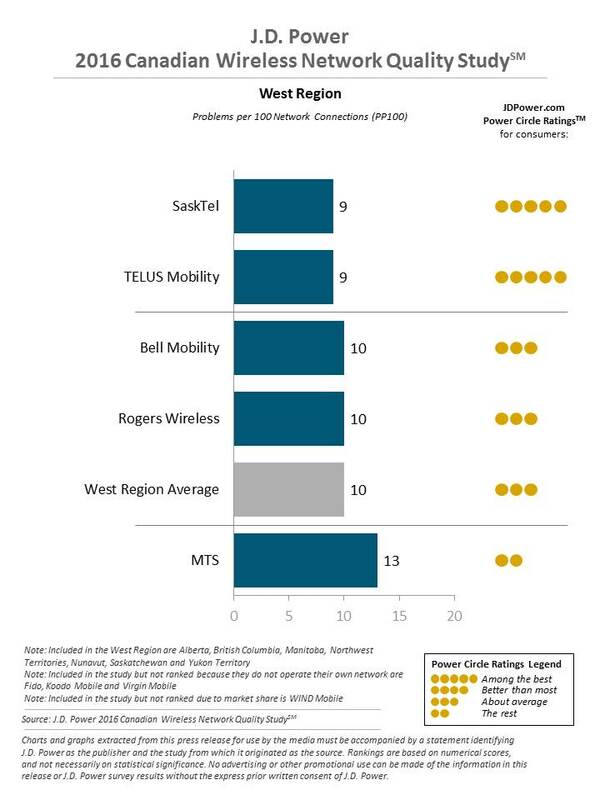 Thanks in part to our increased use of data-heavy mobile apps, a full 10 per cent of wireless connections in Canada now experience performance issues, according to the 2016 Canadian Wireless Network Quality Study, released on Thursday by American marketing information services provider J.D. Power and Associates. The study, which involved approximately 14,500 mobile users across the country, measured wireless network performance in three areas – calling, messaging and data – by recording the number of problems per 100 connections (PP100), with a lower score reflecting fewer issues. J.D. Power also divided the results into three geographic regions – east, Ontario and west – and by carrier. Overall, the company discovered network problems had risen from an average of nine PP100 in last year’s study to 10 PP100, largely due to an increased use of mobile apps and features: for example, use of video chatting among respondents rose from 14 per cent in 2015 to 18 per cent; share location rose from 10 per cent to 14 per cent; and mobile payment use rose from 14 to 19 per cent. By contrast, the number of calling problems (13 PP100) and messaging problems (5 PP100) that users experienced remained stable compared to the 2015 study. Interestingly, the more websites a customer visited, the more likely they were to experience data problems: for example, customers who visited between five and nine websites in a 48-hour period experienced an average of 13 PP100, while those who visited between 10 to 14 websites during a 48-hour period experienced 17 PP100, according to the researchers. J.D. Power also discovered that customers were visiting more websites on their smartphones than they did last year, checking out an average of 11 sites in a 48-hour period, versus an average of 10 in 2015. The survey also discovered that rural customers (11 PP100) were more likely to experience problems than mobile users in urban or suburban areas (9 PP100 each). Naturally, J.D. 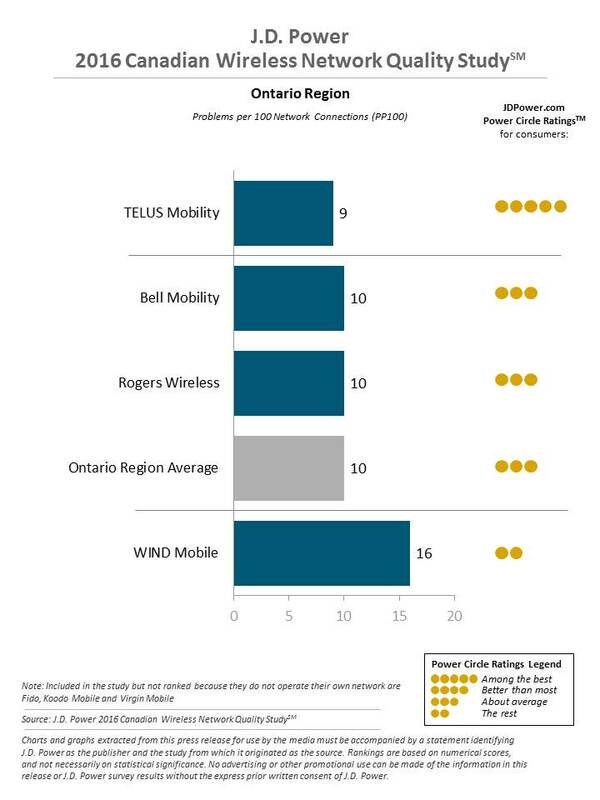 Power’s research also doubles as a ranking of the country’s leading wireless carriers, with Telus Mobility showing strong results across the board. 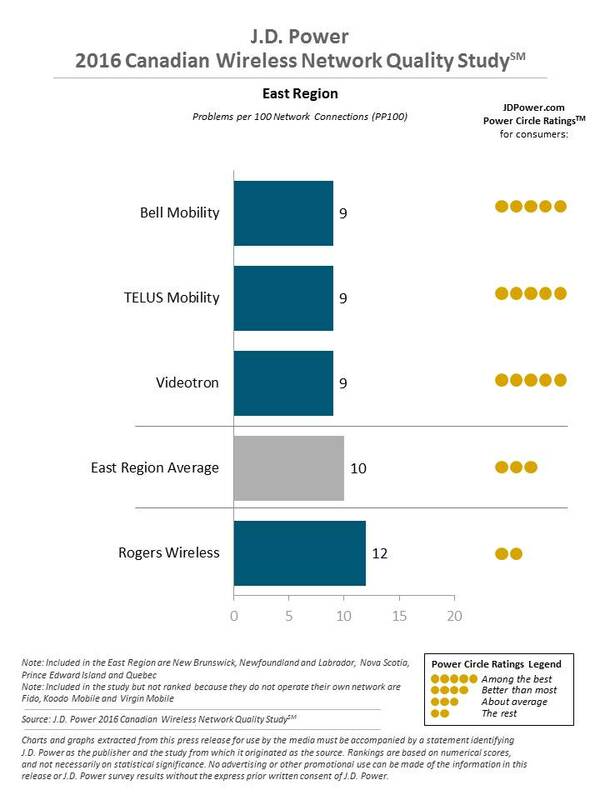 The Vancouver-based carrier was the highest-ranking in Ontario, while it tied with Bell Mobility and Videotron in the east, and with SaskTel in the west. As J.D. Power notes, if there’s a lesson for carriers to take away from this it’s that they need to adapt to today’s power users, not the other way around: unsurprisingly, the researchers discovered that customers who said they “definitely will not” switch carriers over the next 12 months experienced an average network problem rate of 6 PP100, while users who say they “definitely will” switch experienced an average of 19 PP100. You can see the individual results for each region below.